The Frank Callen Boys & Girls Club wraps up the beginning of their Second Century of Service with their Hall of Fame Steak & Burger Dinner. The Dinner will be held on Thursday, November 15th, at 6:00pm, at the Civil Rights Museum. To purchase tickets, please visit www.bgcsavannah.org/ events or contact the Club at 912-233-2939 ext. 6. For over 100 years, the Frank Callen Boys & Girls Club has provided youth development opportunities for the young people of the Savannah community. Members of the Club range in age from 5-18 and are off the streets and involved in life enriching programs during the most dangerous time of day for them, which is between 3:00pm and 9:00pm. Proceeds from the Dinner will support their efforts to continue providing hope and great futures for Savannah’s children. 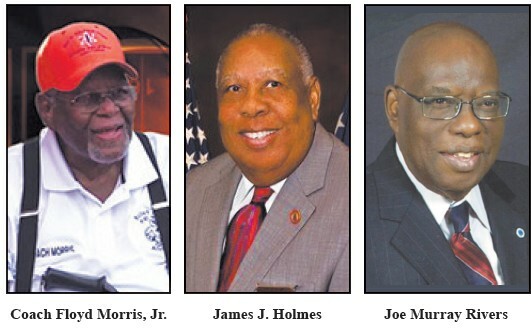 This year the Club is proud to announce that they will be honoring and inducting Floyd E. Morris, James J. Holmes and Joe Murray Rivers into their Hall of Fame. Coach Floyd Morris, Jr., served for many years as a member of the Frank Callen Boys & Girls Club’s Board of Directors and is currently a long-standing member of the Frank Callen Boys & Girls Club Alumni & Friends Association. Coach Morris began his career in 1959, as a teacher of Health and Physical Education at Sol C. Jonson High School. At the same time, he also served as Line and Chief Assistant Football Coach, Varsity Track and Junior Varsity Basketball Coach. Coach Morris went on to become the Head Coach and Athletic Director for five years at Richard Arnold High School. He also served as Director of Community Education for the Chatham County School System and directed the Adult Basic Education program. Later, he became the Principal of Richard Arnold from 1973- 1984. He then served as the Assistant Superintendent of Support Services for the Board of Education, until his retirement in 1986. Coach Morris is married to the former Agatha Curley, a direct descendant of Frank Callen’s wife, Irma Callen, and they have one son, Edwin Charles. Coach Morris has had a remarkable impact on the lives of many children and local athletes throughout the city. James J. Holmes, a native Savannahian, is a graduate of Alfred E. Beach High School and attended Benedict College in Columbia, South Carolina. Commissioner Holmes, well known throughout the community as “Coach Holmes,” is a member of Saint Benedict the Moor Church where he serves on the Church Parish Council, the minister of Healing and Praise Team and the Youth Advisory Team. He is a dedicated and strong children’s advocate. His encouragement to youth to set goals and accomplish them and to do the best in all their endeavors were noticed by Mr. Walter B. Simmons. In 1960, Mr. Simmons chose James Holmes from the playgrounds of Crawford Square to join the staff of Frank Callen Boys Club. He worked as a game room keeper, group leader for junior boys and served as Physical Director and Program Director. Because of his commitment to the betterment of youth in the community, James Holmes, while employed by the Frank Callen Boys Club, was also employed by St. Pius High School as an assistant basketball coach and later became the head coach. He also was the assistant basketball coach at Savannah State College. James Holmes continues to be a vital member of many community organizations. (Biography provided by the Chatham County Board of Commissioners). All of the 2018 Frank Callen Boys & Girls Club Hall of Fame inductees have given an incredible amount of their lives and careers to the community and the children of Savannah. They all exemplify the meaning of paying it forward, while giving back and Frank Callen is proud to call them their own.